with the Customer Data Hub. See every user, lead, and customer in one place. With a real-time connection to your existing tools and services, GoSquared is the definitive place to connect with the people you care about in your business. GoSquared integrates with your lead-gen forms, signup pages, and other external tools to bring all your contacts, leads and customers together in one searchable place for your whole team. Engage with prospects on a personal level to close more sales. Getting set up is easy – import your leads and we’ll do the rest. 1. Add your leads to GoSquared when they sign up. Send new users into GoSquared when they sign up for your trial or newsletter, or import them as a CSV. It's easy to get started, and we're here to help you. 2. Your leads are automatically enriched with helpful data. GoSquared searches the web for helpful information such as social profiles and company details for every lead so you can see who's behind every email address. 3. Engage personally and close more deals. When you know who you're talking to, you can engage more personally and confidently with every lead. You'll be closing deals faster than ever. Find and qualify your best leads. Automatically. Gather all the info you need to effectively prioritise sales outreach. 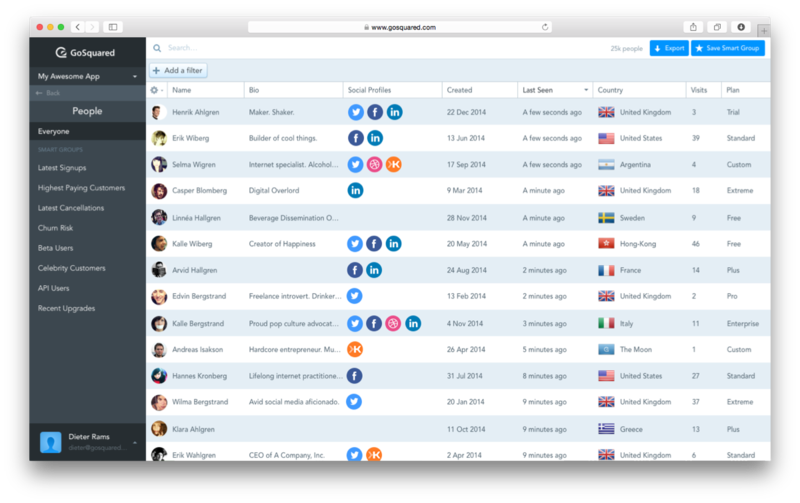 Automatically categorise leads based on their browsing behaviour, social influence, company size and more. A unified profile for every lead. GoSquared gives you the definitive understanding of every lead so you can easily collaborate with sales, account management and customer service. Turn visitors into customers quicker than ever. Share a People CRM profile with everyone on your team and they'll have everything they need to close the sale. Because GoSquared centralises all the browsing activity, emails, and actions a lead has taken, you can easily pass leads between marketing, sales and support. 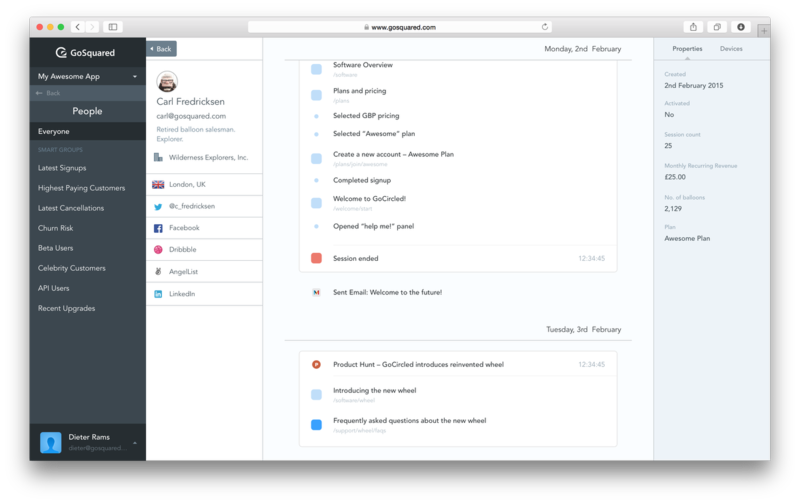 Hundreds of features to enable your team to close more sales. Say no to manual data entry. Say hello to the intelligent Custom Data Hub. Increase your productivity and close more sales today with GoSquared. Every lead profile is automatically updated with the latest activity – see browsing activity, the emails they've received, and more. Send new leads into Slack so anyone on the team can jump on opportunities and celebrate sales deals closing. Sell faster and smarter. Get the Customer Data Hub today.